There is finally a podcast that is for everyone in the dog world, from dog owners to professional trainers. 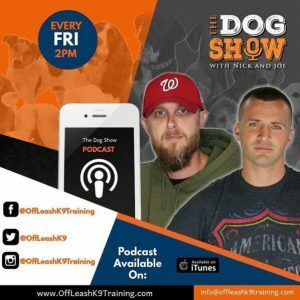 We’re excited to support The Dog Show With Nick & Joe & Off Leash K9 Training. We supply many Off Leash K9 trainers across the US with high quality Demanet bite suits. Nick White is the owner of Off Leash K9 Training a franchise with over 80 dog training locations in the US. Joe is a great friend and an Off Leash K9 Franchise owner. These guys know they stuff and are a blast to listen to. I make sure to tune in to each episode. The Dog Show covers everything canine; training, events, news, client relationships and more. The podcast airs every Friday at 2pm live on Facebook. It is also available on iTunes. You had better subscribe and start listening because we will be on one of the upcoming episodes! Please contact us by submitting the form below or by emailing us directly here.